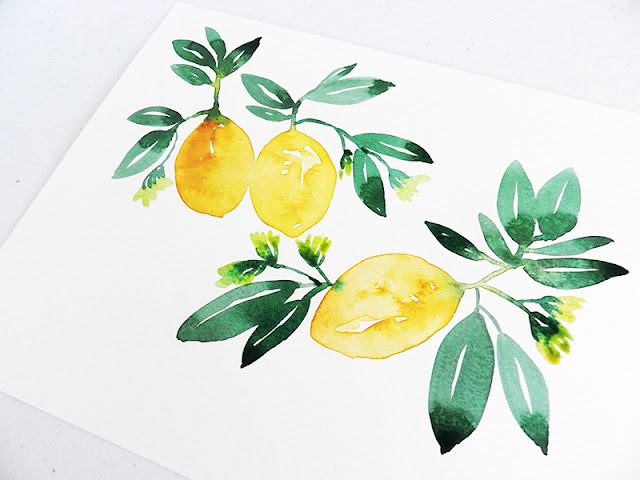 I have a thing for lemons right now. I love their shapes, their colors, their leaves........ and when you add their blossoms, they make the best watercolor paintings! Want to learn how to paint watercolor lemons? I created a tutorial just for you! 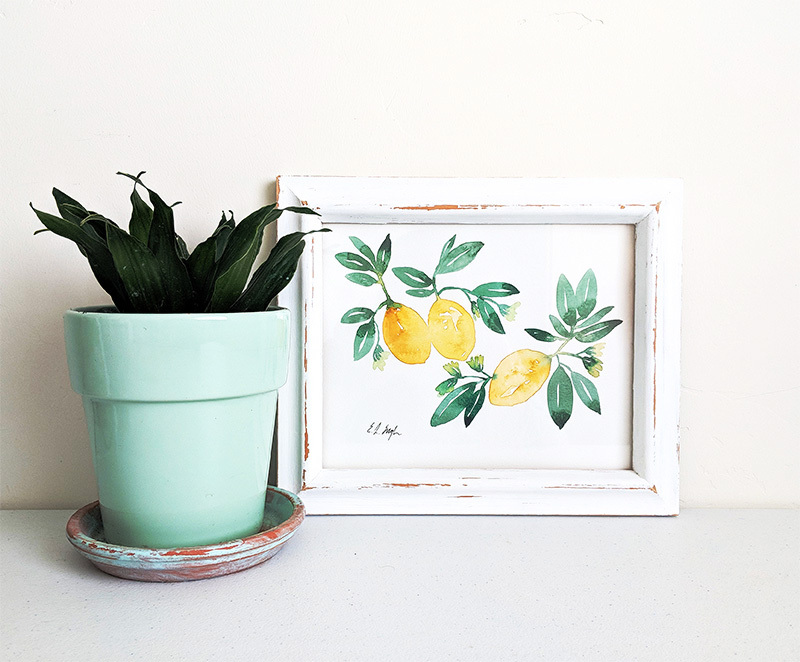 Follow these seven easy steps to create your own lemon painting! 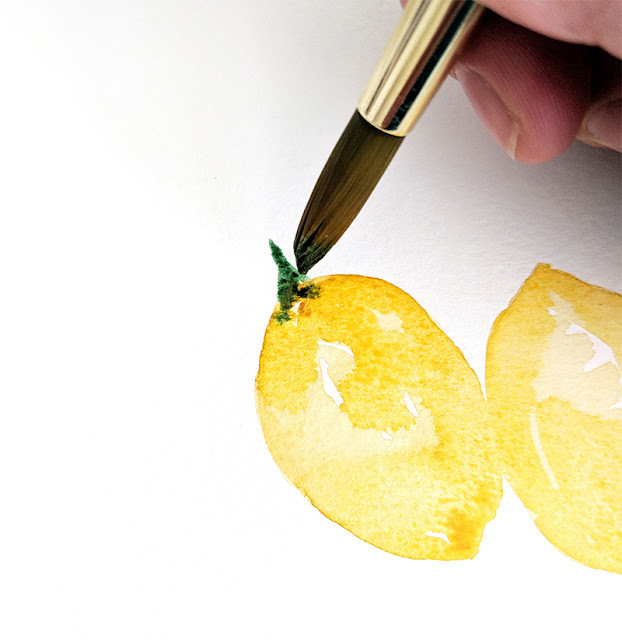 Step 1: No need to sketch out the lemons in pencil first. 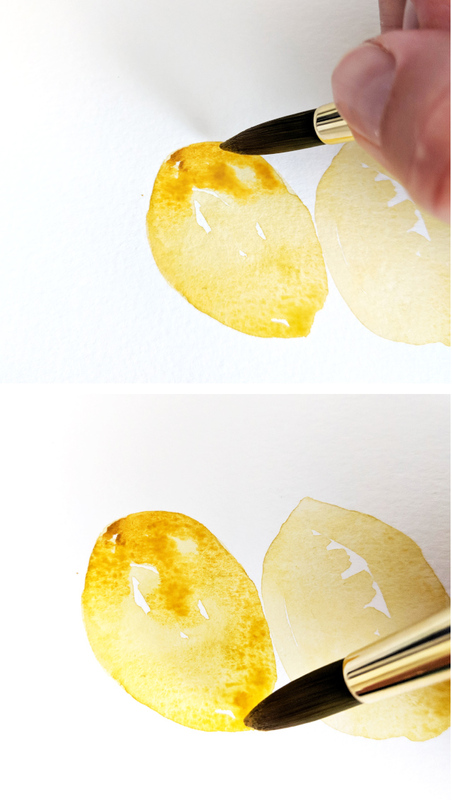 Just "draw" your oval lemon shape with your paint and brush. To get this hue of yellow, I mixed yellow ochre and cadmium yellow. 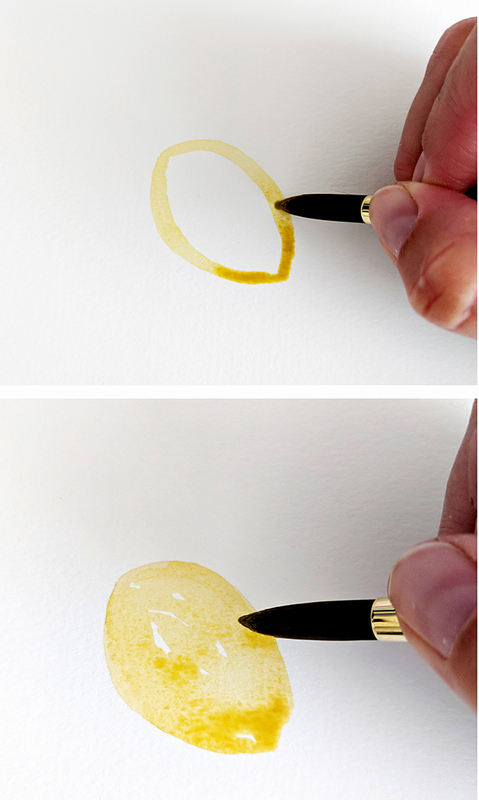 Paint an oval shape with a little point on the end. Keep the paint wet and work quickly so that you can fill in the shape in the next step without creating drying lines. Step 2: Fill in the lemon shape, leaving a few white spots as highlights. Again, keep the paint fairly wet and work quickly to achieve a fluid look. Step 3: While the paint is still wet from the previous steps, load your brush up with a little thicker darker paint. Then add dimension to your lemons by painting on the darker paint around the top, bottom, and edges of your lemons. 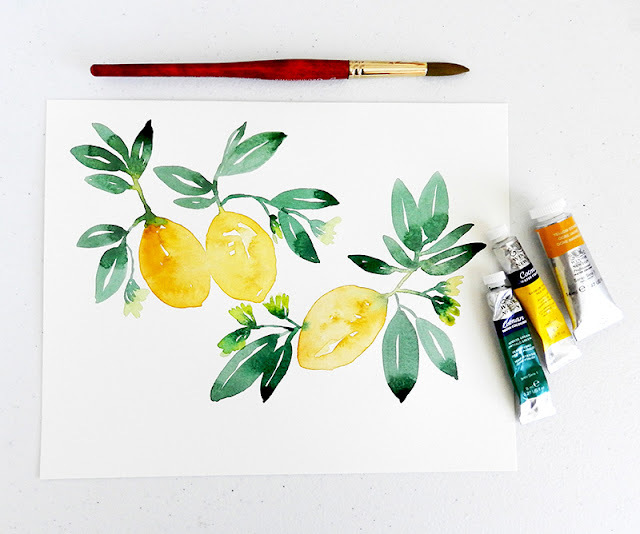 This adds a shading effect that makes your lemons look more realistic. You can dab the darker paint in wet areas and let the wet paint mix that's already on the paper mix and blend with it. It's fun to watch! Step 4: Mix phthalo green with some ivory black paint to create a dark green color for the leaves and stems. 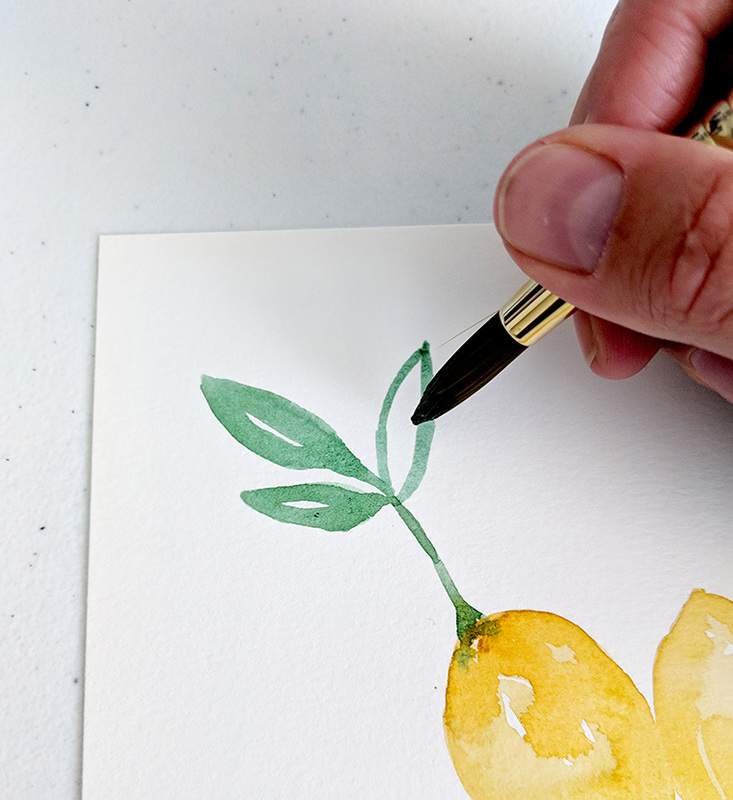 Load up your brush with this lovely green color and paint the beginning of the stem at the top center of each lemon. Make the part that touches the lemon a little wider and gradually make the stem thinner as your go up. It's ok if your green mixes a little with the wet yellow paint at the top. I actually prefer to let the colors mix a little- it's so pretty! Step 5: Curve the green stem upwards, to the side, or you can even make it peek out on the other side of the lemon. This part is up to you! With each stem that you paint, paint some leaves on it. I find that clusters of leaves look best. To paint a leaf, paint an oval shaped outline with pointy ends that connect to the stem. Them fill the leaf in with your green paint. You can leave a little white strip in the middle of the leaf for added interest! Always work with wet paint so that it blends into the stem and work quickly so that the paint doesn't dry while you are attaching leaves to stems. 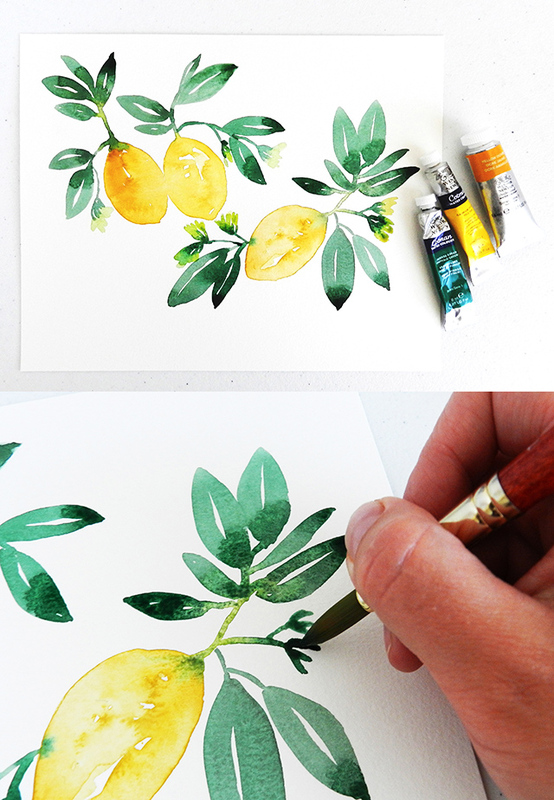 Step 6: Paint some lemon blossoms interspersed between the stems and leaves. With your green paint, create a thin line that ends in a sort of fork shape. Make the line a little curvy. Then with some watery, light yellow paint, add in some blossom petals coming outward from the little fork. Step 7: Fill your paper with lemons, leaves and blossoms. You can copy my composition here or create your own! 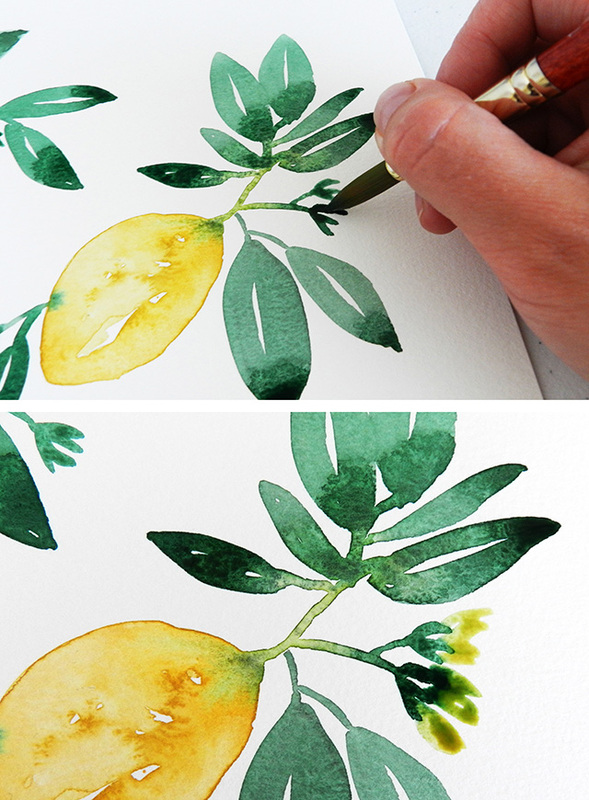 Thank you so much for this awesome watercolor tutorial! Beautiful work! Wow! That little painting looks awesome!In just 7 steps! and then when you framed it, it looks amazing! Thank you for the tutorial!